It seems a little illogical, but actually it makes sense. What perhaps ought to be expected is that if I very much enjoyed the first Madoka film, based on the part of the series that I wasn’t passionate about, surely I should really love the part based on the episodes where I really started to admire the series’ writing. Right? But no – being repackaged as a movie did quite a lot for the first part of the series, especially as the result was a much-increased pace and more of a sense of steady progression. Sadly, the second movie doesn’t enhance its source in the same way here, and because there are far fewer episodes included, the pace is too slow for a standalone film. Of course, this film covers the remaining episodes of the series after Miki succumbs to despair. She must be dealt with, and sacrifices must be made – so having grown close to Miki, Kyouko takes the fall. So as a result, the only one left to deal with the coming Walpurgis Nacht, the coming of a hugely powerful witch no magical girl can defeat solo, is Homura. 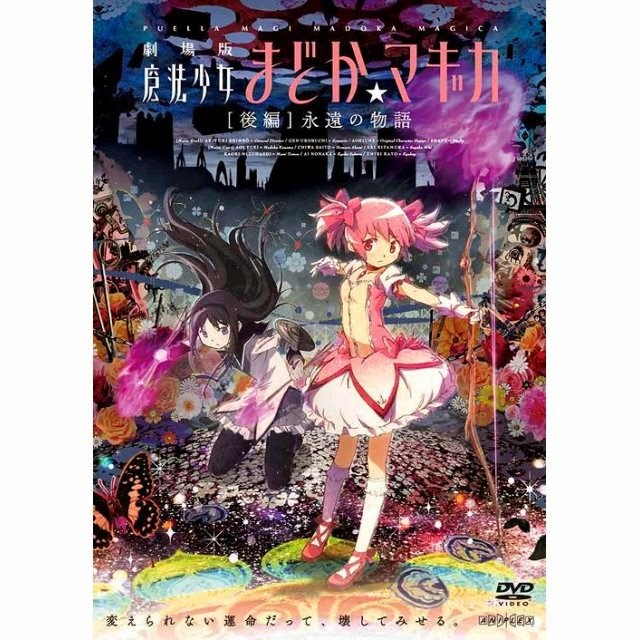 And we learn Homura’s story, which I didn’t see coming in the series and found quite genius – Homura has mastery over time, and has lived this story over and over again, trying to find a way to save Madoka by preventing her becoming a magical girl. Rather than, y’know, talking it through with her – and ‘as you will become the most powerful magical girl ever (thanks to my actions), you will then become an unstoppable witch’ probably would have helped – and rather than perhaps trying to go back and act much more supportive to Miki to ensure she and Kyouko are there to help with Walpurgis Nacht, Homura decides the end of the world is inevitable. Either she stops Madoka becoming a magical girl and the world ends because it seems she can never keep everyone together to fight Walpurgis Nacht, or she lets Madoka deal with Walpurgis, in which case Madoka becomes a far worse witch and the world ends. Of course, Madoka also has a wish associated with becoming a magical girl, and because Homura has made her fate such a significant event, it can be an incredible one. Perhaps she could have thought of a better one – like, y’know, dealing with the root cause of entropy rather than the effect of Kyubey’s race having to harvest energy from human emotions – but nonetheless, Madoka’s wish makes her essentially a god. She removes herself from the timeline and changes the past and future so that every point a magical girl turns into a witch, she stops them. The girl will lose her power and return to her normal life – it is implied – but will not turn into a witch and need to be killed by her former peers. The result of this needs to be all but omnipresent is that she essentially becomes wiped from the real timeline, creating a whole lot of paradoxes because after all, if witches hadn’t been there before, she wouldn’t have been inspired to become this godlike existence. Nonetheless, the sheer magical power of her potential prevails – and there is a satisfying ending where the girls instead battle wraiths to battle entropy, in partnership with the Kyubey race, but only Homura remembers what truly happened. It’s neat and it’s clever. It was a great ending to a series that cleverly challenged the conventions of its genre. It took childish concepts and later iterations that sexualised them and subverted them all – with a presentation that despite my initial misgivings because of Hidamari Sketch I think really work. Those potato-headed girls have a classic, winsome look that adds to the subversion. I do sometimes feel Madoka is a little over-rated. While very good, it is not genius and isn’t nearly as thought-provoking as, say, Kaiba nor as clever a subversion as Princess Tutu. It is only the sheer silliness of magical girl shows that make it seem so intelligent by contrast. This is of course not to say that it isn’t smart. It emphatically is. It’s also compelling viewing and definitely well worth seeing, and there’s more to explore in its universe. Which is why a third film makes sense – a chance to build on what has been established, and perhaps even subvert that. And that, as we will see, is precisely what the next film does.